Who needs a fancy car museum where the cars are pristine and desired...The junkyard museum is my go to where I gawk at cars living out their golden years being harvested. 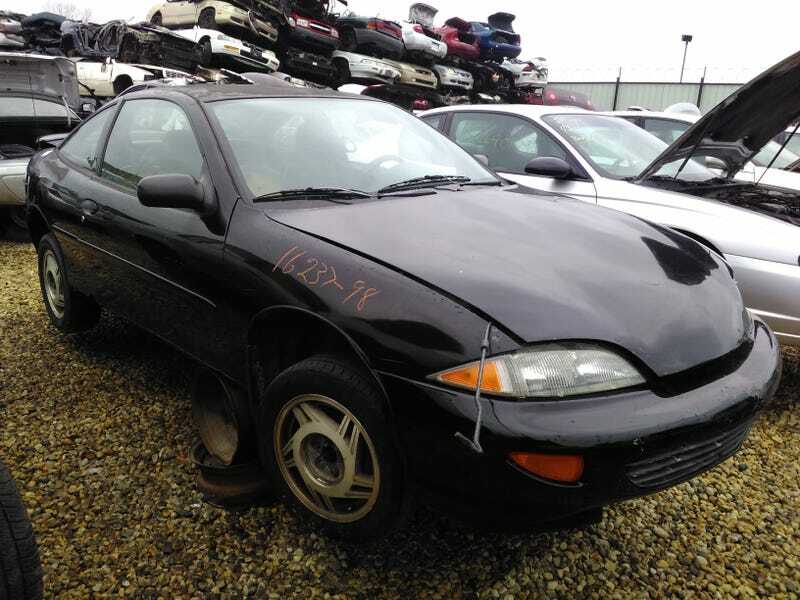 Today’s spotlight falls on a 1998 Cavalier Rallysport. The Rallysport is no rally car nor is it sporty, but it sounds awesome! The Rally sport was the red headed stepchild of the Cavalier line-up. It technically slotted higher than the base model and lower than the Z24 trim. I say technically, because it was essential a base model with lipstick. The Rallysport was only an appearance package made to move cars off dealer lots. If you look at our junkyard specimen, you’ll notice this one doesn’t even have a front sway bar. This savvy cavvy is wearing GM’s FE0 soft ride suspension package. The birth of a Rallysport is quite easy. Starting with a base model, it gets upgraded from stock 14" wheels to 15", with a mixed bag if you get factory alloys or just steelies with hubcaps. Next the front and rear bumpers are painted to match the body color as bases customarily have oem unpainted bumpers. Rallysports then had the rear spoilers and side door guard mouldings (w/out z24 script) lifted from their performance Z24 counterparts. To complete the package, it received the very 90s “Rallysport” decal on its quarter panels...not a guarantee though, some didn’t have it. This one had it and it’s a cool touch. Rallysports had an uprated instrument package with a tachometer not seen on normal base models. This one had an Isuzu derived 5 speed manual paired to the base 2200 motor. This is the last iteration of GM’s Iron Duke replacement before their Ecotecs took the helm. Changes from the previous L4 2.2 were new heart shaped cylinder head chambers with shallower dished pistons, a new guideless pushrod rocker valvetrain and reworked intake runners for increased torque. Output is 115 hp with 135 lb ft of twistie. In 1999, the Rallysport script changed from purple to gold which was a little more subtle.